KIEV, Ukraine -- Exactly two years after the beginning of the Euromaidan protests that toppled Ukraine's government, a cluster of demonstrators stood under black umbrellas along a barricade on a street known by many in Kiev as "Heroes Alley." 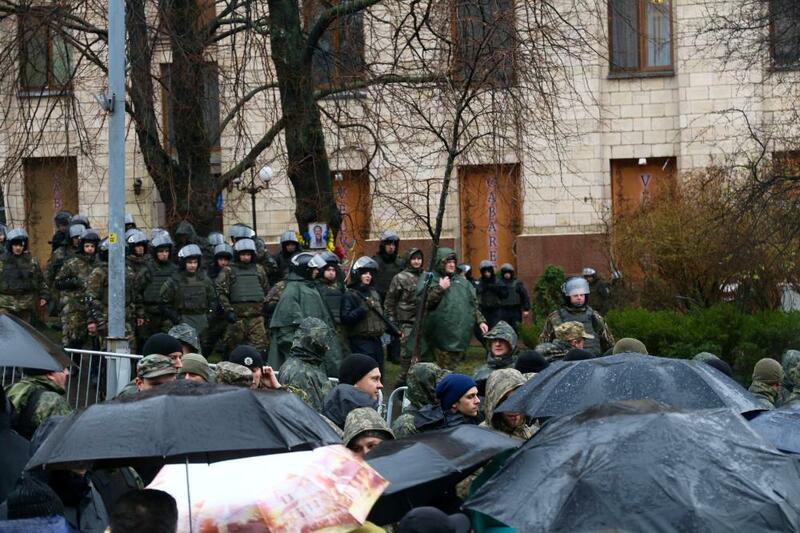 Soldiers block protesters from approaching the "Heavenly Hundred" memorial in Kiev on Saturday. 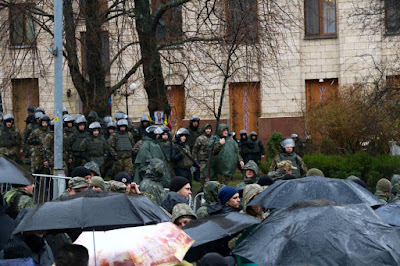 Police in riot and army gear stood on the other side of the barrier, stopping people from approaching a memorial to the "Heavenly Hundred," the men and women killed by sniper fire during the unrest that preceded the Ukrainian revolution. The rain pelted down on the group of roughly 200 protesters, who sporadically chanted anti-corruption slogans as they waited for the arrival of Ukrainian President Petro Poroshenko on Saturday. After last year, when Poroshenko was booed and heckled during a wreath-laying ceremony, the chanting demonstrators were kept far away from the memorial and only people on a preordained list were allowed through the barriers. "I wanted to make my voice heard," she said. "People do not have satellite television, they believe what they are told about Poroshenko doing what he promised." It was a far cry from the fierce protests that had filled Maidan two years before, when students began a demonstration against the government's refusal to sign a declaration that would bring the country closer to the European Union. Police and security forces responded with violence, leading to months of rallies on the Maidan. The 2013 protests continued into 2014, culminating with three days of extreme violence that began on February 18 and left more than 100 dead. President Viktor Yanucovych ultimately stepped down and fled to Russia, triggering an ongoing conflict that led to Russia's annexation of Crimea and Russian-backed separatists forming breakaway republics in eastern Ukraine. Two years later, there are still no answers as to who was responsible for the deaths. Additionally, many Ukrainians feel let down by Poroshenko's government, which has not delivered the anti-corruption changes it promised in the wake of Euromaidan. "The country is still ruled by corruption," Olena said. "It is still the same people in power, nothing has changed." Kateryna Kruk said she was on Maidan at the peak of the violence last year. She said that what started as a people's revolution has been taken over by the political elite. "Poroshenko wasn't on Maidan on February 21. I was," Kruk said. "And now he has blocked the street to the Heavenly Hundred memorial. There's special list to come closer to Heavenly Hundred memorial. Was there a special list of politicians to be on Maidan when we were shot?" Away from "Heroes Alley," a massive stage was set up in preparation for a concert later in the evening. The sound and light tests give Maidan an atmosphere more similar to a festival than a commemoration. "It was supposed to be a day of dignity and freedom," Kruk tweeted alongside a picture of armed guards at the barricade. "Is this how authorities understand those words? I am so disappointed." "Once again I am standing in the rain next to the police," she said. "Some things never change on the Maidan." "И надеемся, что наши международные партнеры и в дальнейшем будут придерживаться политики непризнания оккупации Российской Федерацией Крыма»", - подчеркнул Президент. I am sure that president try to say that international partners will continue not to recognize the annexation of Crimea by Russian Federation and do recognize occupation of Crimea by Russian Federation, not a wise versa as it says in the quotation.